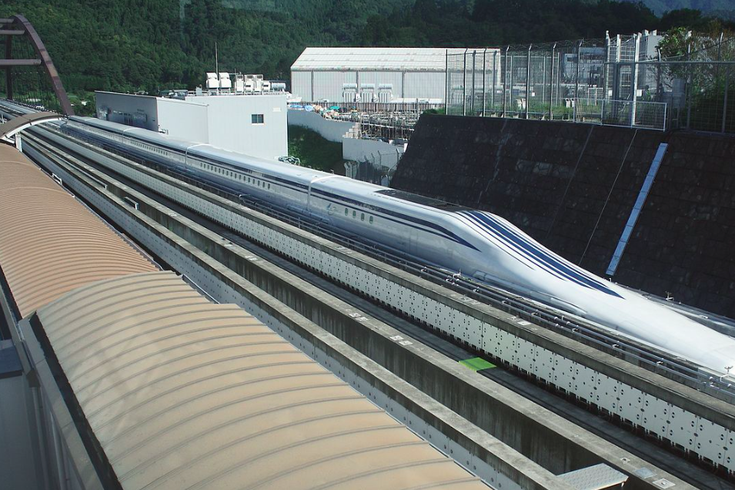 SCMaglev (Superconducting Magnetic Levitation) test track in Yamanashi Prefecture, Japan. Proponents of the rapid rail maglev "bullet" train that grabbed headlines a few years ago believe that a 30-minute trip between Philadelphia and New York City is a very real prospect in a not-too-distant part of this century. The Japanese-designed technology, more than 50 years in the making, uses magnetic forces to reduce friction and centrally levitate the rail car just inches off its tracks. With speeds capable of more than 300 mph, the maglev train is twice as fast as the Acela Express, the fastest train in the United States. Talk of a project in the Northeast Corridor has gradually built momentum over the last decade. With a test track up and running overseas, Japan's push to partner with the United States on the technology is also heating up. Led by the Baltimore Washington Rapid Rail (BWRR) and The Northeast Maglev (TNEM), the first leg of any such rail project would be between our neighbors to the south, as reported in a feature published this week by The Baltimore Sun. The BWRR estimates the first leg of the U.S. project would cost between $10 billion and $15 billion, most of it necessarily through taxpayer-funded federal grants and loans. Since the Obama administration provided a $28 million grant for a study of BWRR's proposal in 2015, the project has picked up support from Republican Maryland Gov. Larry Hogan. Congress is reportedly considering another $150 million appropriation for the project, whose two current route proposals follow the Route 295 corridor and would be more than two-thirds enclosed by tunnels. But as the maglev's future prospects come into focus, detractors have dismissed it as an impractical high-speed project that would benefit only the rich. Community groups in the Baltimore and D.C. areas have argued that the maglev would blow past their neighborhoods, divert taxpayer resources away from greater needs and potentially create ecological disasters that endanger public health. Similar revolts have sprung up along the proposed Japanese route, while others question the economic feasibility of the maglev's intensive civil engineering demands. A federal analysis of both proposed maglev routes is expected to be released some time this fall. Another path to a maglev train on the Northeast Corridor may come from gradual improvements proposed by the Federal Railroad Administration. Its Preferred Alternative Plan, details of which were released in late 2016, envisions increased train speeds along the Northeast that would reduce travel times at a more modest but still considerable rate. A map from the FRA's plan already included a new stop at Philadelphia International Airport, suggesting the government's long-term strategy may be to create an infrastructural path that would eventually support the introduction of maglev technology. The path to high-speed transportation in the Northeast has become a much more competitive space in recent years, particularly with the aggressive effort by Elon Musk's The Boring Company to lay the groundwork for Hyperloop travel in the United States. Musk also has sought approval for an initial route between Baltimore and Washington, D.C.
BWRR officials believe they can pull together the financial and political will to begin construction on the first leg of the Northeast Corridor maglev by 2020. They would hope to complete by 2027, in conjunction with the opening of Japan's first commercial stretch. How quickly the technology advances in the U.S. will be determined over the course of the next two years. In addition to federal dollars and environmental studies, the future of the maglev will also become a question of how fiercely the public resists its costs and collateral effects.